Nebraska Hoist is your One Stop Shop For All Your Lifting Needs! 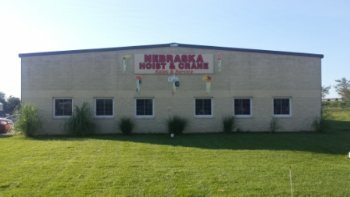 Nebraska Hoist & Crane is truly a "one stop shop" for all your lifting needs. Whether you are looking for a basic Sling, an affordable Hoist, an Inspection or a 100 Ton Crane, we have the right solution for you. Nebraska Hoist & Crane is a reliable, established company that you can trust to help determine your lifting needs. We go the extra mile to make sure the product we recommend is the right one for your particular application and need. Instead of just "taking an order", we dig deeper, so a well thought out and CORRECT solution can be provided. We make sure we don't just "sell" Equipment, but also offer you site inspections, training and advise on how to incorporate our lifting devices into your business so that you can be efficient and profitable. Nebraska Hoist & Crane employees are committed to Sincerity, Consistency and Integrity in everything we do, to give you the ultimate confidence and assurance when choosing lift equipment. Nebraska Hoist & Crane is a National Distributor for most major Manufacturers, including CM Systems, Cleveland TramRail, Detroit Hoist, Electro Lift, Gorbel, Harrington, Ingersoll Rand, JD Neuhaus, and Yale .… just to name a few. All are Recognized Industry Leaders, that build quality products. From Slings, Hoists, Hoist Parts and Repair, Bridge Cranes, Gantries, Jibs and Monorails, Tether Track/Fall Arrest, to specialty items like Lifting Clamps, Spreader Bars, Lift Tables and Moving Carts, Nebraska Hoist & Crane is a "one stop source" to make your operation easier, safer, and more profitable. We have partnered with a well known engineering firm to be able to design and produce the perfect solution for your particular application.